Recently I was asked to read and review a novelette after offering some honest opinions on a group in social media. During my first read, I began to notice similarities between our creative writings: neither of us had slowed the pace of the action and because of that the smaller, more intricate details that make our readers love our characters were overlooked. In a first draft it’s acceptable to get the words out in whichever order you deem necessary to get them out of your head and onto the page. Your first port of call once you’ve left your novel to simmer on its own for a while is to read the story, check for plot holes and ensure that the narrative flows well. It’s not at this point that someone should publish, no matter how tempting it is. I have a load of terrible habits in my writing, I write too many short concise sentences instead of expanding them. These short sentences, although good in some circumstances, limit the reader, stopping the natural flow of the story and causing readers to read quicker without taking in the information. Look at the below image, shamelessly stolen from Google. It’s important to remember that writing is a creative outlet. Just because you are not composing music or crafting a sculpture does not mean you’re not creating a piece of art. Art is beautiful. Art is shocking, enticing, and bold. It wants to grab your attention and has you asking questions long after you have finished consuming it. Writing should be the same. 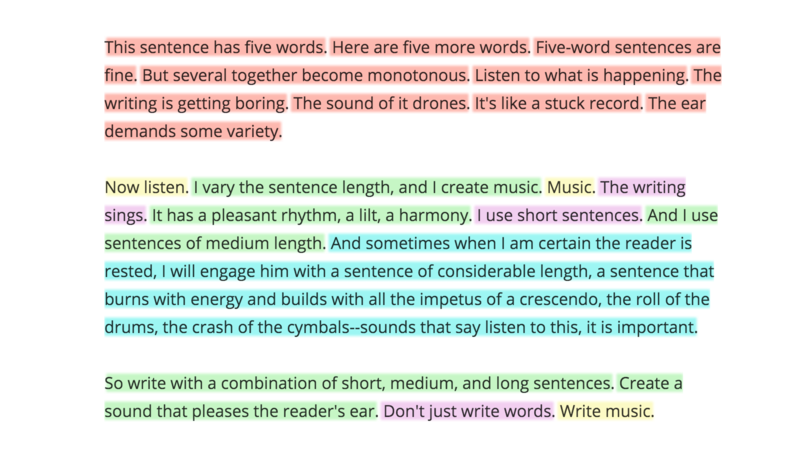 I know it’s primitive and a reminiscent of school homework but to really improve your writing you need to practice using a variety of sentence types. Short sentences. Medium sentences that begin to lure you in. Long, lengthy sentences that have you carried away typing on your keyboard, longing for the day that your novel will finally be finished and a publisher has made you an offer you cannot refuse. Take a writing prompt, maybe something from The Writer’s Digest website or Reddit, and practice writing in different styles. I promise that it will help. Remember, you should be having fun with writing. If it becomes a chore then take a break. Words and sentences don’t always materialise straight away, sometimes they need to simmer in your brain. Forcing them simply will not work and will only cause them to dissipate. What did you think of these writing tips? Let me know your thoughts in the comments below or alternatively let me know on Twitter or Instagram @kirstyawriter. I have a similar vice but with a slightly different twist: my sentences tend to be too long in the first draft. It slows down the pace unnecessarily. I’ve gotten better at it, but I still have to go back and rewrite a lot when it comes to sentence length variation. I think you also hit on a key misconception in this post. Just because you’ve finished writing doesn’t mean you should publish yet. You may have covered all the basic plot holes but that doesn’t mean your work is the best it can be yet. Writing takes a long time and a lot of work to craft. Even successful writers who claim to only write one draft (I’m thinking of Anne Rice here) actually do a lot of editing and rewriting along the way, so the “first draft” isn’t actually a first draft once they’re finished but the compilation of a million little drafts. I can’t tell you how many books I’ve read from smaller-scale writers lately that have had great potential but could use a lot more editing.